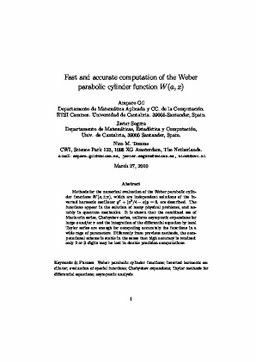 Methods for the numerical evaluation of the Weber parabolic cylinder functions $W(a,\pm x)$, which are independent solutions of the inverted harmonic oscillator $y''+(x^2/4-a)y=0$, are described. The functions appear in the solution of many physical problems, and notably in quantum mechanics. It is shown that the combined use of Maclaurin series, Chebyshev series, uniform asymptotic expansions for large $a$ and/or $x$ and the integration of the differential equation by local Taylor series are enough for computing accurately the functions in a wide rage of parameters. Differently from previous methods, the computational scheme is stable in the sense that high accuracy is retained: only 2 or 3 digits may be lost in double precision computations. Keywords Weber parabolic cylinder functions, inverted harmonic oscillator, evaluation of special functions, Chebyshev expansions, Taylor methods for differential equations, asymptotic analysis.